Our world-class equine facility in Wilsonville, Oregon, demonstrates our comittment to excellence in sporthorse breeding. 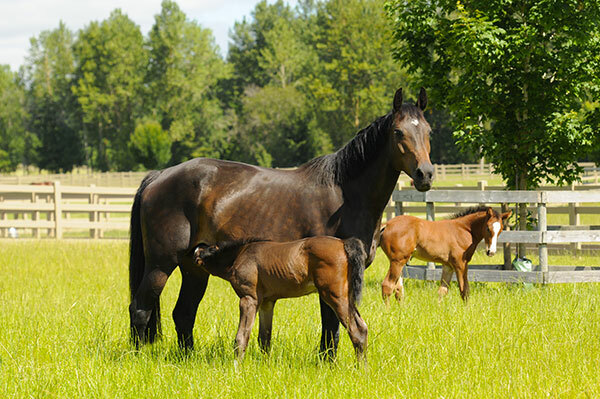 A limited number of spaces are available for year-round broodmare care. 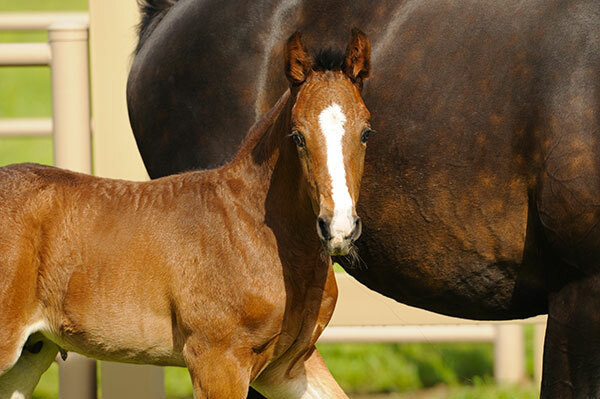 We work with an equine nutritionist to ensure that nutritional needs are being met during pregnancy and post foaling. 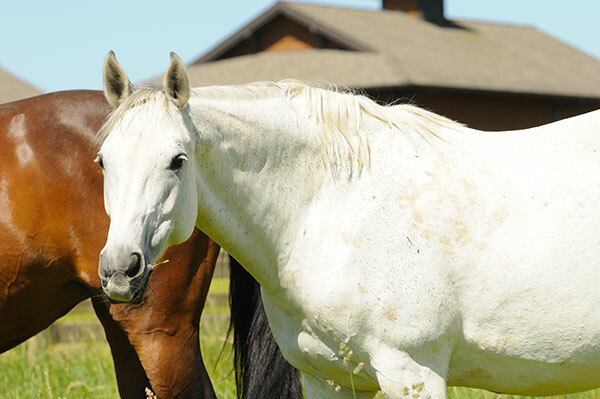 Mares are groomed daily and checked for overall health. 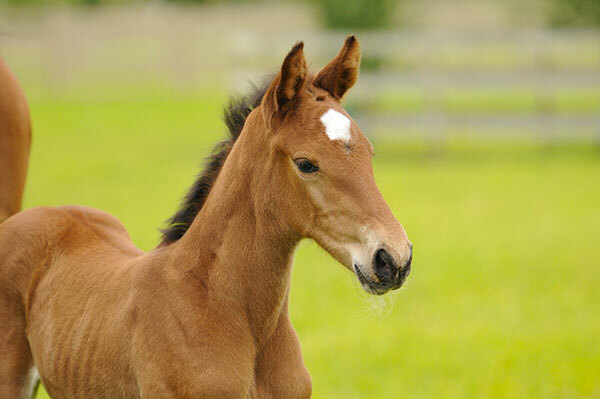 We employ highly skilled equine reproductive veterinarians, offering a variety of breeding options for your mare. 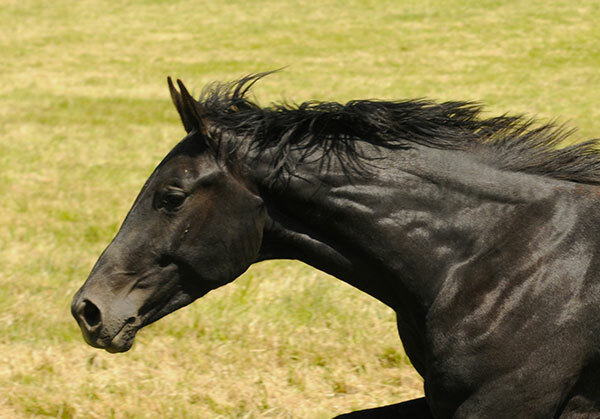 Our mares have daily access to pasture turnout during the day, and are brought in at night to comfortable 12’ x 12’ stalls with attached paddocks. 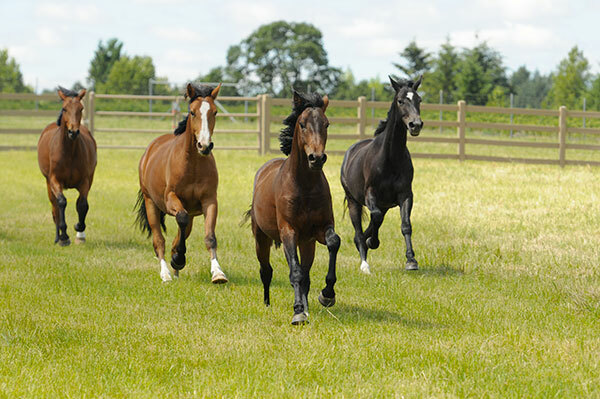 Our pasture fencing is safe synthetic post and rail that will not break and cause injury. 30 days before due date, mares are moved to 12’ x 24’ foaling stalls. 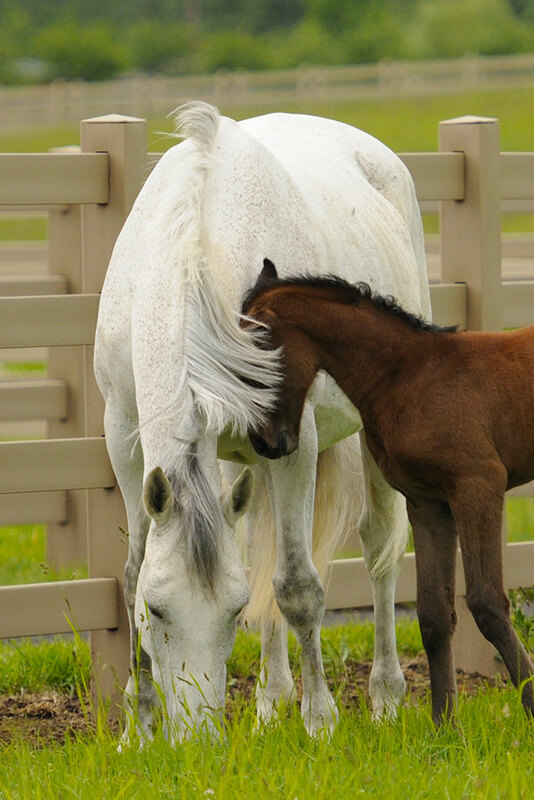 There are cameras mounted in each stall, and mares are monitored nightly as their time for foaling approaches. 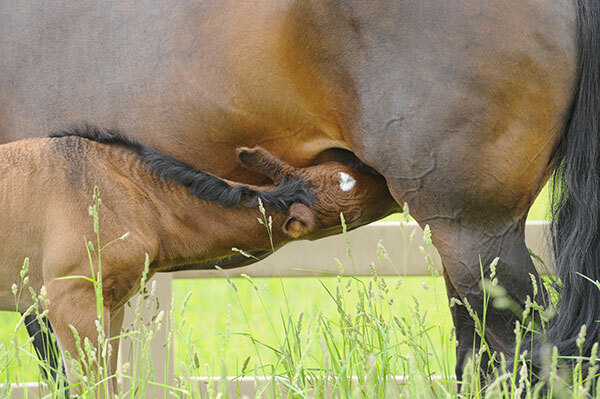 We test milk calcium daily to help predict when the mare will foal. 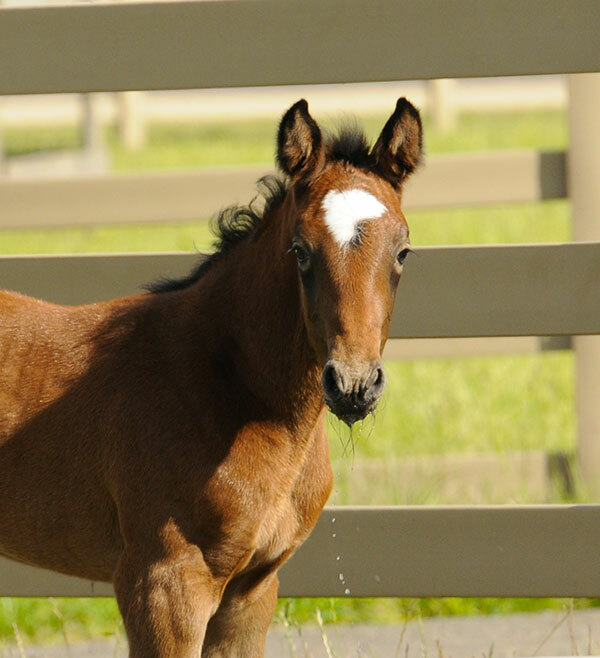 We offer a short-term mare care option for those wanting to have the breeding work done at Wild Turkey Farm and then take their mare home after she has been checked in foal at 30 days. 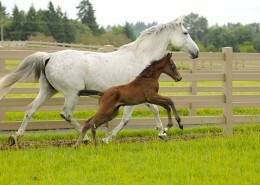 A longer stay may be arranged if space is available. Mares will receive daily grooming and turnout during their stay. We offer quality Eastern Orchard Grass hay, Timothy and Alfalfa. 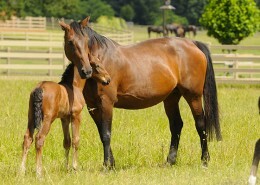 Grain concentrates and vitamin/mineral supplements are also available, or can be supplied by the mare owner. 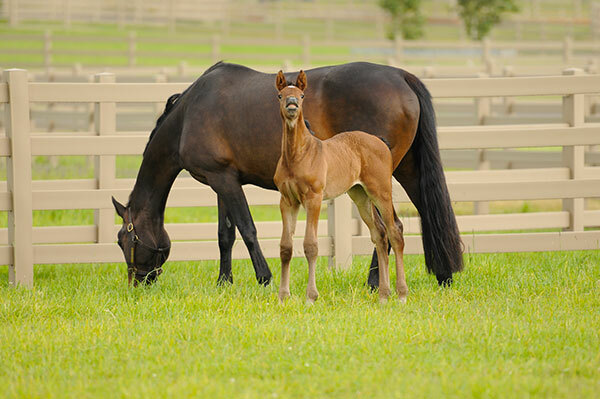 We offer foaling services for mares managed under our long-term mare care program. 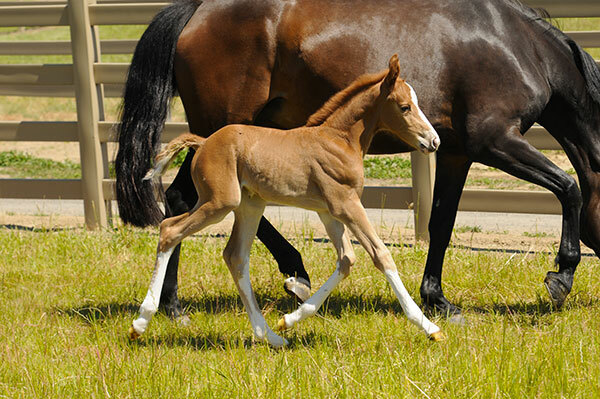 Our experienced staff attends foalings, and mares are assisted during delivery if needed. 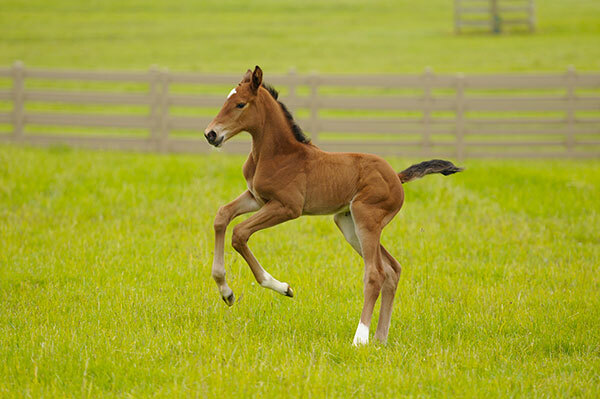 We test the mare’s colostrum quality by refractometry shortly after foaling, to ensure the foal will receive adequate passive antibody transfer. 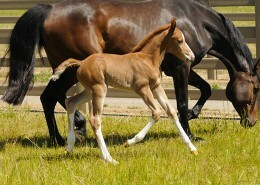 The foal’s umbilical cord is treated after foaling, and then 3 times daily with diluted Nolvasan solution. 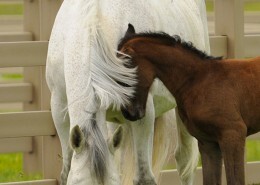 An enema is given to the foal to decrease the risk of meconium impaction. 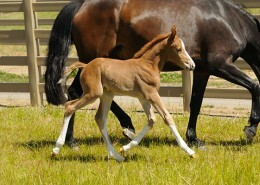 At 12 hours of age, a blood sample is taken from the foal and tested for IgG antibody level. 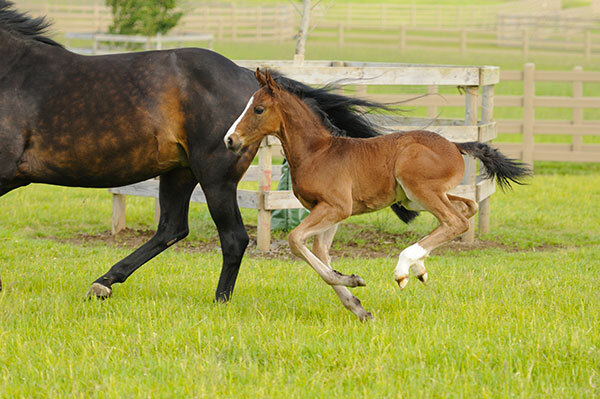 Mares are dewormed within 24 hours of foaling to limit the foal’s risk of parasite infection. 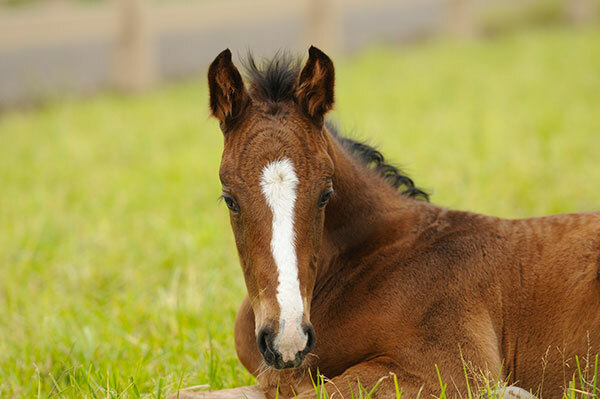 There are infra-red heaters mounted in all foaling stalls, which provides warmth if needed during cold weather. Foals are handled daily from birth. 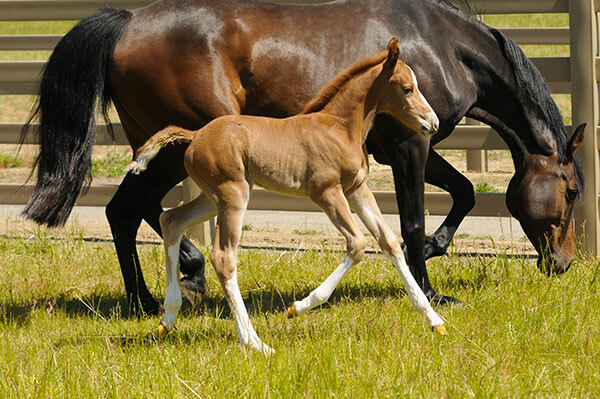 Haltering, leading, grooming and allowing feet to be picked up are skills the foal will learn during it’s first few days of life. 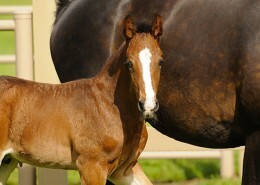 Mares and foals are kept in for 5 days after birth and monitored. 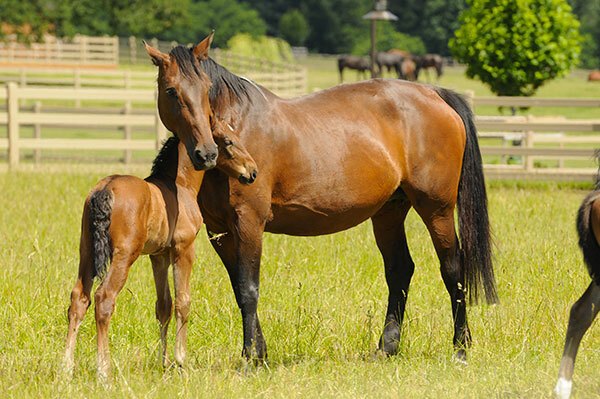 If all is good after 5 days, mare and foal will be turned out in individual grass pastures during the day and brought back to their stall for the night. 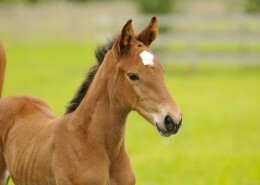 Mares and foals will then go out in groups based on compatibility. 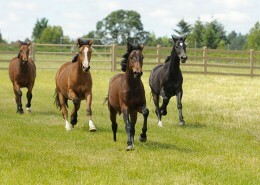 As the weather improves over the summer months they will enjoy 24/7 turnout in our large grass pastures. 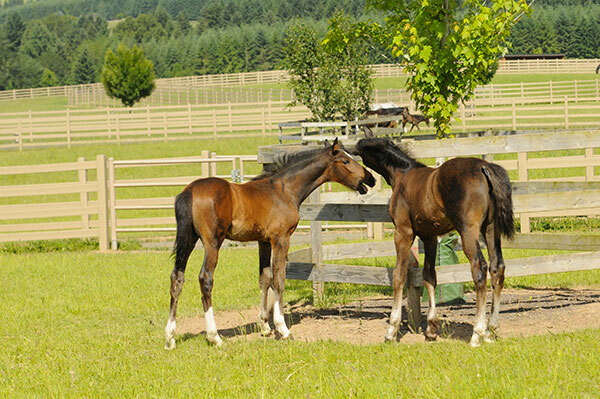 Weanlings are divided into compatible groups and allowed to grow up in a herd pasture environment with safe fencing. During the winter months they have access to large run-in sheds bedded with straw. 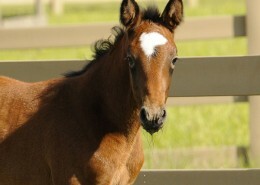 They continue to receive routine health care and farrier work. 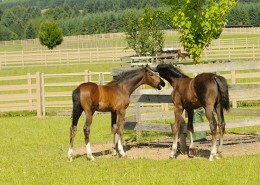 This living arrangement is continued through the yearling and two-year-old years. 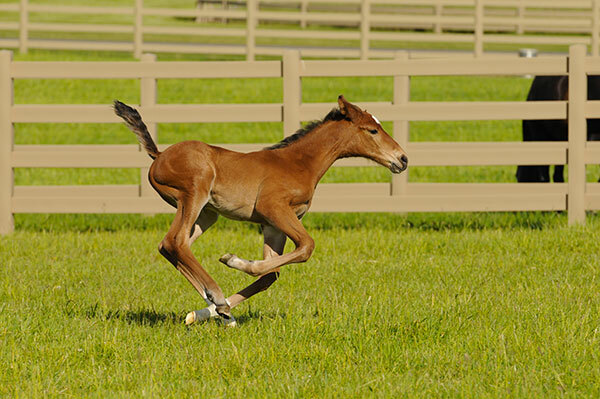 In the fall of their two-year-old year, training begins with light groundwork and starting under saddle.